Product #11683 | SKU CONVOPENGUDC | 0.0 (no ratings yet) Thanks for your rating! 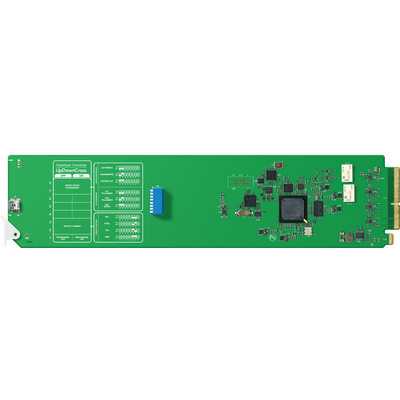 The Blackmagic Design OpenGear Convertor - UpDownCross is a SDI signal convertor/distributor that's fully compatible with the OpenGear standard, for installation in a rack-mounted chassis. (Blackmagic offers several OpenGear frame configurations – sold separately .) This model performs high-quality signal conversion, whether SD to HD, HD to SD, or one HD format to another – 1080i/p to 720 or vice versa. NTSC & PAL conversion (input and/or output of either) is also supported. The UpDownCross convertor features an auto-switching 3G/HD/SD-SDI input and seven configurable 3G/HD/SD-SDI outputs for flexible, broadcast-quality signal conversion & distribution. There's also a reference input (blackburst & TriSync) and SDI loop output. The convertor adapts SDI audio delay to accommodate the video processing in order to keep everything in sync, and it applies an equaliser, re-clocker, and 10-bit de-serializer to the SDI input signal. You can update and/or reconfigure the OpenGear Convertor - UpDownCross in three different ways: via the USB 2.0 connection, over a network via Java-based DashBoard software, or by setting its mini switches.